My partner and I founded The Naked Leaf CBD Company after spending months of due diligence on health and wellness alternative opportunities while living in Los Angeles/Venice Beach, CA. We are passionate about plant-based health solutions and products for people and animals. CBD is slowly becoming an accepted and legal alternative, as well as much more common product on the scene for its numerous health benefits. We spent many months, sourcing the purest form of CBD, from organically grown fields of industrial hemp, providing all the nutrition hemp has to offer, with zero THC or psychoactive properties. Once we felt that we could offer the ultimate CBD extracts in our product ranges, we created our official home in the UK, offering high-quality, pure non-GMO, THC-free, cruelty-free CBD oils, sprays, salves and capsules. From soil to oil - it's made in the USA, and third-party laboratory tested for quality and consistency. We took every stringent step to ensure our customers' satisfaction and created the highest concentrations, best efficacy and fastest bioavailable CBD. We want people to have the freedom to choose to optimise their health and wellness with the power of natural, pure hemp! A monthly box of your essential Naked Leaf CBD products can aid in feeling rejuvenated, relaxed, relieve stress and keep you focused. We source only the purest organically grown CBD for our ranges - naked hemp, free of pesticides and hormones, non-GMO, solvent-free. Our plants are naked - the naked whole industrial hemp plant is used to extract the oils which have been carefully grown to allow for the most CBD per plant. Pure. Naked. Organic. Clean. Health. Without question, our 'Gel Capsules' box, they are so easy to incorporate into your daily regime. They are cost-effective, and more importantly, you'll feel the positive benefits in no time at all! 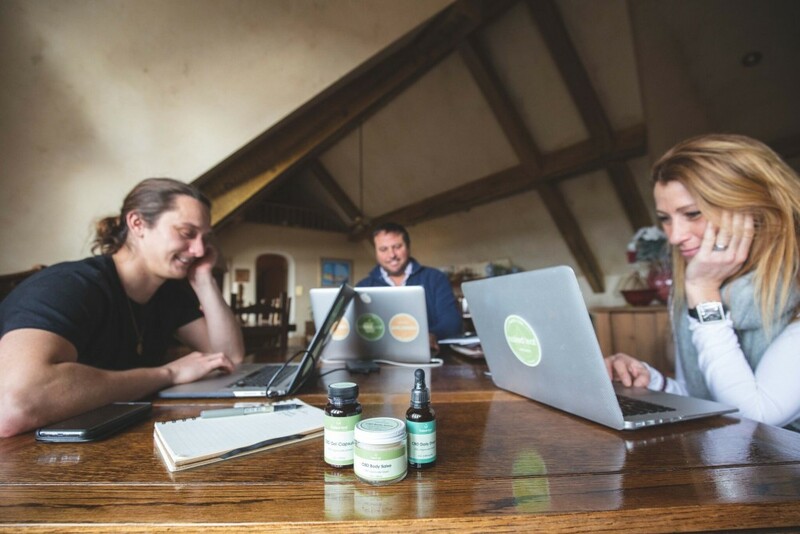 We have nine Naked Leaf CBD people - three founders, one creative director, three brand ambassadors, one web developer/IT guru and a social media marketing director. We've actually just subscribed via your site to the Katie Leamon 'Post' stationary box for the office; I was drawn to the beautifully presented, premium products. It looks stunning! Ellen DeGeneres - firstly, who hasn't heard of Ellen? She's not only enormously famous but also a lifestyle guru who promotes essentially everything we stand for as a business. We'd put endless products in which cover all the family including your pets; it would be its very own health and wellness education package in a box. The 'outside the box' way of thinking retail should be (no pun intended). Allowing subscribers to experience the joys of their favourite necessities (and treats), arriving on their doorstep every month, without thought, is genius! Busy people tend to forget to treat themselves, and this allows for the forgetful busy individual to get the premium products they deserve! Calm your mind with Naked Leaf CBD. Stay motivated and on top of your health and wellness with CBD gel capsules every month.